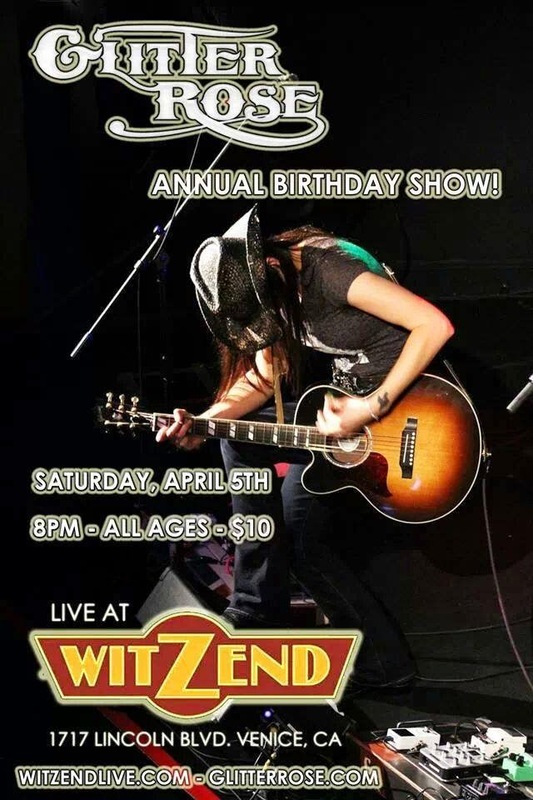 Los Angeles, Calif - The 8-time music award winning Glitter Rose will celebrate her 29th birthday with an intimate performance at the most popular listening room in LA at Witzend in Venice on April 5 at 8pm PST. While supplies last, Glitter Rose will be giving away a FREE t-shirt with every paid entry. Glitter Rose’s music is breaking ground as the new sound of Southern Rock meets Country. In 2013, the 28-year-old Texan was recognized with two awards including Best Rock Artist and she received the Album of the Year Award for Dead or Alive at the 2013 Artists In Music Awards at Key Club in Hollywood, CA. In April, Glitter earned the title for Best Music Video for her song “Buda Negra” at the 14th Annual Bare Bones International Film Festival in Muskogee, OK. During the same month, Glitter was honored with the prestigious nomination for Texas State Artist – State Musician by the Texas Commission of the Arts. Glitter was also chosen as one of the three finalists in Hard Rock Rising’s 2013 Global Battle of the Bands. Then in November, Glitter was honored at the 23rd Annual Los Angeles Music Awards when she took home the award for Country Artist of the Year. Glitter took home four additional awards for Artist of the Year, Performer of the Year, Best Southern Rock Artist, and Best Music Video at the 3rd Annual Artists In Music Awards held at Jon Lovitz Theatre in Hollywood, CA on Friday, February 7, 2014. She has been involved in several new projects including hosting a successful charity auction for Susan G. Komen held at the Gibson Showroom in Beverly Hills that helped make it possible for 32 women to obtain mammograms at no charge. Glitter also made an appearance in the upcoming film “American Girl” and she wrote the title track for the film with the same name. The song “American Girl” was accompanied with her new track “Tennessee Time”, a song that was also nominated for Country Single of the Year at the 23rd Annual Los Angeles Music Awards.